Khalil Alamour, a Bedouin attorney, mathematician, and community leader from the village of Alsira in the Negev/Naqab, Israel. 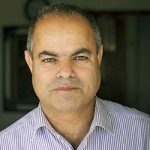 As well as being an attorney and Co-Director of Alhuquq Legal Center, Khalil is also a member of Alsira village Community Council and member of the RCUV (Regional Council for the Unrecognized Bedouin Villages in the Negev) and since 2009 a secretariat member of Negev Coexistence Forum for Civil Equality. In this capacity he has initiated and partnered in many projects to enhance the welfare of his village – establishing a daycare in the village, preparing a detailed plan for the village in order to present alternative solutions to governmental offices, persuading the government to establish an afternoon program for youth in the village and hosting tours, such as our Tree of Life Journey.